Eco-Odyssée offers outdoor adventures for families and nature lovers. 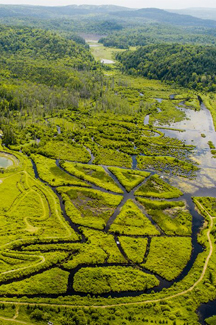 Our biggest attraction, a unique water labyrinth created in a swamp, has more than 6.5 km of water routes. Come explore this maze by canoe or pedal boat! A multitude of adventures, from simple observation to solving puzzles, are designed to appeal any type of visitor. Other pedestrian adventures that take place in a bog of conifers and in another mysterious labyrinth will be able to put value in your Eco-Odyssee experience. This year, guided tours are offered for those wishing to discover and improve their knowledge the of the marsh biodiversity. Stay tuned for educational and fun activities organized at Eco-Odyssée. These include turtle nesting observation, construction of duck nest boxes, and a nature getaway to learn the basics of animal tracking.